I was approached by The Rowans to build there new site as the site I had built for them when employed by King's College School in 2006 was a liitle tired. The old site was built on a Joomla platform and I was pleased to be able to build them a new site on the much more powerful Drupal platform. an online calendar viewable by week or month. newsletter pages with content broken up by year group and photos of the previous week's activities. a document library with archived letters to parents. 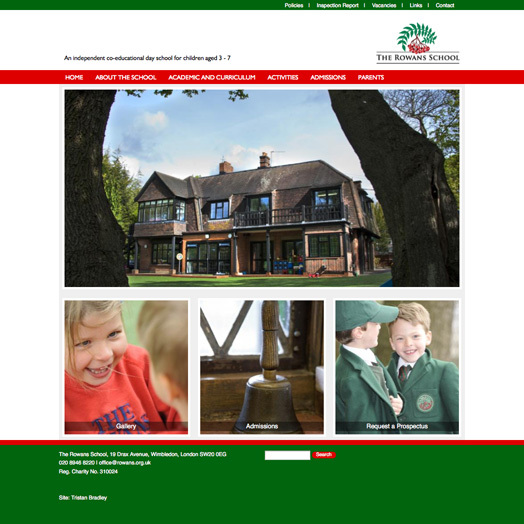 an administration interface which allows the School to choose from a range page layouts by ticking a checkbox. online forms for contacting the School and requesting a prospectus. The site holds a record of all site submissions and this can be downloaded as a CSV file as required.